New Gracanica Monastery, IL - On Saturday, January 1, 2011, His Grace Bishop Longin of New Gracanica and Midwestern America, along with His Grace Bishop Peter of Cleveland (ROCOR), served Hierarchical Liturgy at New Gracanica Monastery on the occasion of the blessing of the New Gracanica “Three-Handed” Icon of the Mother of God, brought to the monastery by the Venerable Archimandrite Metodije, Abbot of the Royal Lavra Hilandar on Mt. Athos. 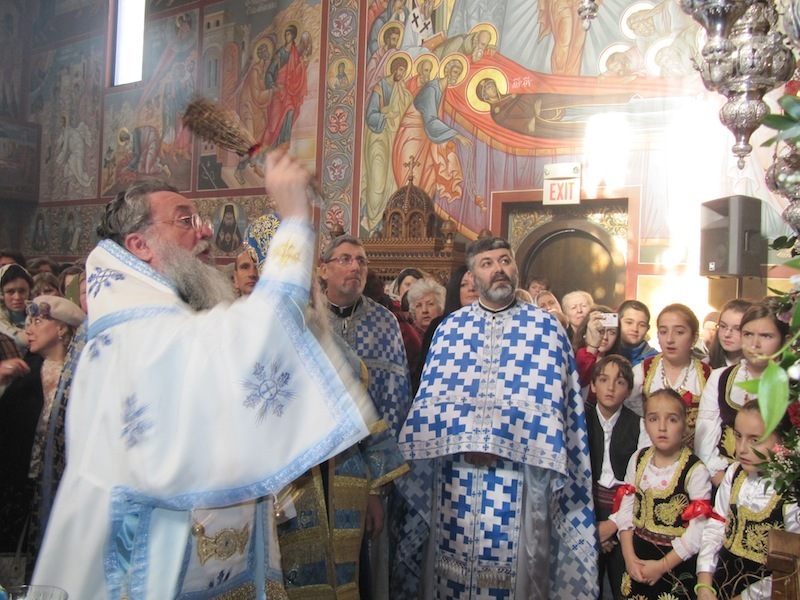 Serving with Bishops Longin and Peter, were 18 priests and 8 deacons of the Diocese of New Gracanica and Midwestern America and other Orthodox Dioceses. After the Prayer behind the Ambo, His Grace Bishop Longin blessed the New Gracanica “Three-Handed” Icon of the Mother of God, which has been enthroned on the left side of the nave in a most-beautiful hand carved wooden throne. The icon, which is a gift of the former Diocesan Circle of Serbian Sisters of the former Diocese of America and Canada, Metropolitanate of New Gracanica, is adorned with silver, gold and precious and semi-precious stones. The beauty of this holy icon cannot be described in words and will always adorn our Holy Monastery, as a protectress for generations and ages to come. This icon brings the blessing of Holy Mount Athos to our Diocese, along with the first visit of an Abbot of Hilandar Monastery to North America, who brings our Diocese the blessing of his predecessors, St. Sava and St. Simeon the Myrrh-Gusher. Following the blessing, His Grace Bishop Longin spoke about the meaning of this icon to our Diocese and Monastery, as well as the meaning of the original Trojerucica, not only to the Serbian people and identity, but to Orthodoxy world-wide. After Divine Liturgy, a banquet was held in the Monastery Hall, at which over 450 people were present. During the meal, Mr. Milivoj Randjic, the Director of the Foundation for the Restoration of Hilandar, spoke about the destruction of Hilandar Monastery a few years ago by fire, and the dyer need for its renovation. Mr. Randjic quoted St. Nikolaj Velimirovic, who said that the state of Hilandar Monastery mirrors the state of the Serbian Nation and visa versa, for which reason we must renew ourselves and Hilandar Monastery. Archimandrite Metodije also spoke at the banquet. He spoke not only about the renovations now taking place in the walls of Hilandar Monastery, but also about the spiritual renovation that is taking place in the monastery. As he said, if there is no spiritual renovation and revival, then our physical renovation of the place is in vain and for nought, because the monasteries of Mt. Athos are not museums, but rather places of habitation and spirituality. As the prayerful day came to a close, all present felt the blessing the Mother of God bestowed upon us through her enthronement in New Gracanica Monastery. Yet again, this most-sacred and magnificent monastery is adorned with even more beauty – beauty which only is due to the Mother of our Lord, God and Savior Jesus Christ.